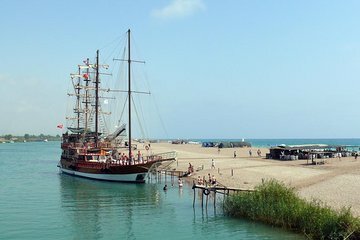 Cruise the scenic Manavgat River on a full-day trip from Belek and Kadriye, and spend the day relaxing on deck, swimming in a river delta, sunbathing on a sandy beach, and exploring the Grand Bazaar of Manavgat. This full-day tour includes a hearty lunch of Turkish cuisine, round trip transport from your hotel, and a stop at the Manavgat Waterfall. Meet a driver at your hotel in Belek or Kadriye for a morning departure, then begin the hour or so trip to Manavgat Harbor, a river port outside the bustling city. Board a two-level riverboat on the Manavgat Pier, and set out downstream, cruising to a picturesque river delta. Disembark to swim and sunbathe at a sandy beach that can only be reached by boat, then refuel for an afternoon of exploring with a lunch of freshly grilled fish or chicken, vegetables, and rice or bulgur, along with seasonal fruit and dessert. Following the meal, cruise back upriver to Manavgat, mooring in the center of the town. Head to the nearby Grand Bazaar, the perfect place to browse everything from textiles to shoes, accessories, and fresh produce. You’ll have time to explore the market before continuing to the Manavgat Waterfall, a quick drive outside of the city. Walk into the park, wade in the waterfall, or just enjoy a drink at a river-side restaurant. This full day excursion concludes with return transfer to the original departure point, and drop-off at your hotel. This was one of 3 boat trips we booked via Viator during our 10 day holiday in Turkey, we are glad we booked it, the staff on board are really lovely, efficient, helpful and friendly, we took advantage of purchasing some of the pictures taken on board by a professional photographer because they were excellent quality not just snaps and though we rarely buy the pictures offered at various attractions we visit these were worth buying, the trip itself started with a punctual collection from our hotel in an extremely smart, clean and comfortable minibus, we had contacted the tour operator the day before as requested to confirm our collection time which was 45 minutes before the advertised time so important you do check this, unfortunately we then spend an hour and a half touring other hotels to collect other guests, the first two hotels we visited had nobody there so we ended up having to make another stop at the tour operators local office where a hotel had bussed guests to meet the mini bus after they had failed to check their collection times adding to the time it took to get to the Cruise, we also had to meet up with the Landrover Safari to drop off people who had booked that tour, still as the mini bus was so good it wasn't a terrible experience, arriving at the river we were welcomed on to the ship and it was explained to us that we could pay 10 euro each to visit the Manavgat Waterfall, an option we chose to add to our trip, we then set off down the scenic river towards the ocean, there are some interesting views on the way down the river including many other tour boats all made in a pirate ship style, then passing the boatyard where they are carrying out maintenance on some of the tour boats and you can clearly see a brand new tour boat under construction. from the river you move into the sea and follow the coast a short distance where they anchor up to allow some time for swimming, then more shoreline cruising and into a small inlet where the boat docks and you can have some beach time, at the beach you can at an extra cost parasail or hire a jet ski but we had already done that at the hotel so we just basked in the hot sun, shortly before departure the meal is served, a simple butterfly chicken steak with rice and salad in keeping with all the other tours we have done and we enjoyed the meal as we headed off back up the river where two coaches were waiting to take those going to the waterfall and those going straight to the Grand Bazaar. The Manavgat waterfall is not impressive by any stretch of the imagination and our half hour there was ample time for some photos and a cup of coffee, the attraction itself though is currently undergoing a major refurbishment and from the pictures of what the finished product will be like it is going to be a lot better soon. Then the coach took us down to the Grand Bazaar, a huge market in downtown Manavgat, I didn't expect much because my research had shown our tour date to be on one of the normal days and not a specific scheduled market days but the market is huge, your taken to a café, given a map and told what time to return to the café to meet the bus, this is essential because you will get lost in the market, if your looking for knock off designer brands of sunglasses, bags, purses, clothing etc this is the place to be, some stalls have the prices marked up but some require negotiation, for example we bought a phone protection sleeve for 15 lira rather than the first asking price of 45 lira. Buying or browsing the market is interesting and bigger than anything we saw on our many excursions around the Turkish villages and towns including Antalya itself. Based on value for money and what you get to see and do we would highly recommend this tour and the operators that run it and pre-booking through Viator especially in peak seasons.